The Northern Lights, a.k.a. 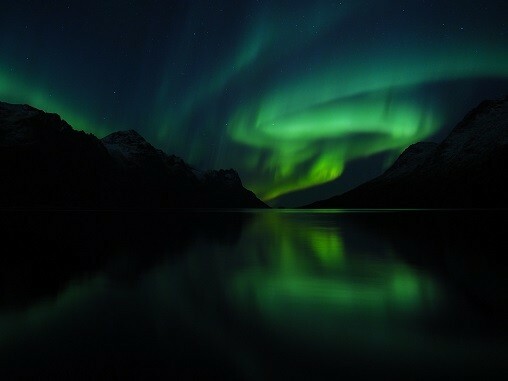 the Aurora Borealis, is one of those things that manages to make it onto everybody’s must-see list. It’s for good reason. The Northern Lights live up to all the hype. But you only have so many days off in a year. How can you maximize your chances for catching the Aurora Borealis? Where should you go? Which Arctic cruise should you take? What are the Northern Lights and what causes them? The Northern Lights are, as you would imagine, something that requires a night sky in order for them to be appreciated. Remember, the Arctic receives almost around-the-clock sunlight at the height of its summer months. Therefore, you’re going to want to skip the July cruises. Another consideration, know that Arctic cruises can only run while the waters are ice-free. Therefore, you’re going to want to book a sailing that lands somewhere between December and March. Cruises can only sail when the waters are open and ice-free, allowing ships to pass. When you see the Northern Lights shimmering overhead, you’re actually seeing a kind of force-field at work protecting the surface of the Earth. The sun has cycles (about 11 years long) where it ups and then descends in the amount of particles in sends out in waves. These waves flare out from the sun in all directions. Some of them naturally cross the path of Earth. These Coronal Mass Ejections (a.k.a. “solar winds”) are made up of charged particles. These particles meet with our magnetosphere (the magnetic “force field”) that lays in our atmosphere at anywhere from 80 m to 400 km above sea level. The magnetosphere causes the solar waves to bend and break around the Earth. This mixes them up with oxygen or nitrogen particles in the sky. The different colors of the waves are a result of the different particle interactions and the height they occur at. For the very peak of Aurora Borealis efficiency, you’re going to want to try to get into the strip of geography known as the Auroral Zone. It is found between 66° and 69° north. The Lights have the possibility of being seen anywhere in the Northern Hemisphere. However, this Zone is a much more active Auroral hotspot than other locations. That being said, here are a couple of spots around the world that not only offer a good chance of seeing the Lights but also have many charms of their own in case the overhead clouds aren’t cooperating. Spitsbergen, part of the Norwegian archipelago of Svalbard, offers up some of the Arctic’s beauty in its most natural state. As you sail under the blue and green curtains of light overhead, you’ll also be treated to pristine icebergs and glaciers along with starkly beautiful snow-capped mountains. There are your typical cruises, and then there are adventures. Antarctica cruises definitely fall into the second category. So what’s the difference between an Antarctic adventure and your everyday cruise sailings? Well, if you’re in the mood for overcrowded tourist towns that are barely distinguishable from each other no matter what country you’re in then an Antarctic cruise is definitely not for you. 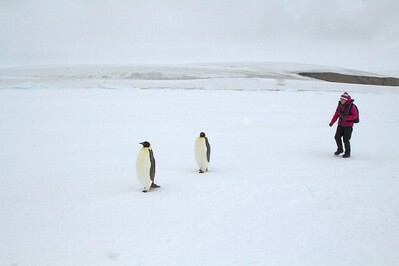 Antarctic adventures are exactly that – an adventure. You’re not paying to move from one tourist t-shirt shop to another. Instead, you’re taking a trip to explore one of the most remote and pristine regions left on the planet. Not only that, but Antarctica is the only place you won’t find mosquitoes. Of course, taking a cruise that pushes further means that you’re going to have to be a little more prepared than you would have to be for your typical tourist-trap sailings. 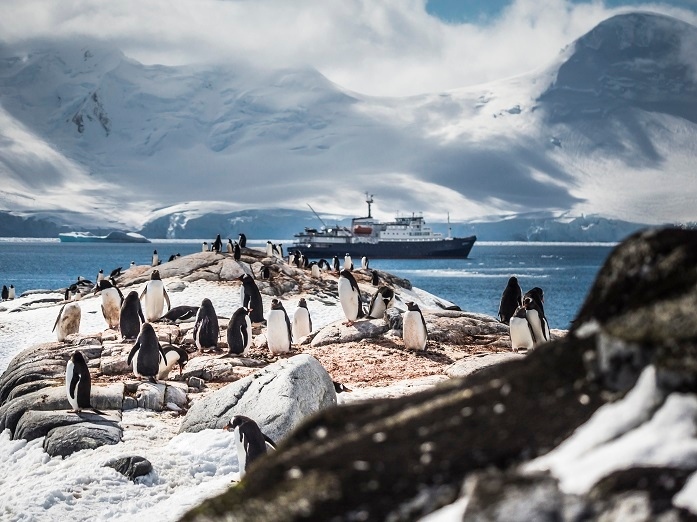 Let’s take a quick look at some Antarctic cruise tips that will help you make sure you’re going to get the most out of your expedition. Antarctica is a huge region, claiming some 14 million km2 (5.4 million miles2). It’s simply too big to take it all in during one cruise, especially when you consider that A) some of its interior is pretty unreachable due to distance and B) various Antarctic voyages have different/alternative/additional stops along the way (e.g. the Georgian Islands, the Falkland Islands, etc.). Your best bet is to list out what draws you the most to an Antarctic cruise. And so on. Even within these points you’re going to have sub-categories. For example, if you’re looking to check specific birds off in your bird book you’re going to have to choose between different destinations. So don’t pick an Antarctic cruise at random. Sort your list until you know what’s most important to you, and then do a little reading to make sure you choose the cruise most suited to what you’re looking to experience. This depends on both you and your destination. If you’re taking a cruise to Antarctica itself (as opposed to one that visits the remote island regions of the southern oceans) then you’re going to cross the Drake Passage. Sometimes the Drake Passage is completely calm, but you shouldn’t count on it. Instead, prepare as if you’re fully expecting the Passage to be at its roughest. If you’re prone to seasickness then visit your personal physician ahead of your trip and get him or her to hook you up with some Dramamine (or other motion-sickness drug). Motion sickness drugs are not cures, they’re preventative. You take them ahead of time and they build up in your system, preparing you for rougher days at sea. Are Antarctic cruise ships like regular cruise ships? Antarctic cruise ships run the gamut from luxury-oriented (including spas and hot tubs) right down to simple sailing vessels. It’s really up to you to choose which kind of ship you want to board. Keep in mind though that the more meat-and-potatoes ships have the advantage of being geared towards pushing into bays and fjords that the more luxurious ships can’t reach. Just like with your list of things that you want to see, you should take a moment to figure out what kinds of activities you want to participate in. Some cruises won’t have certain activities because of their routes. Or they may have a variety of activities that you have to pay for individually. And some activities require previous experience and log-books/certifications (i.e. 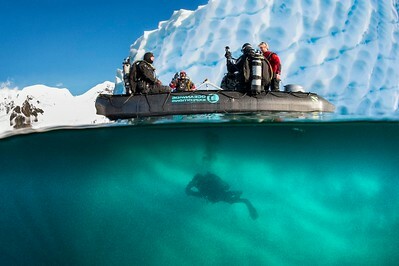 diving, mountaineering). These cruises tend to offer a wide variety of activities suitable for beginners under one blanket price, allowing you to try a little bit of almost everything. You don’t have to be an athlete to take part in an Antarctic cruise, but you should at least be mobile and in good enough shape to enjoy easy hikes. Aside from the onshore activities, you’re also likely going to have to be limber enough to get in and out of Zodiacs in order to get from ship to shore. Most decent Antarctic cruise lines will send you specific information about what kind of clothing you should bring when you sign on with them. The short version of that information is to bring layers, with back-ups for when your clothing gets wet. Layers help trap air between them that gets warmed by your body, which in turn helps keep you warm. Also, it allows for much easier temperature control if you’re heating up thanks to taking part in a hike or a kayaking session. Depending on the cruise, you might be provided with rubber boots. If that’s not the case, you’re going to want waterproof rubber boots with good grips on the soles and a high enough top to keep water from sloshing in as you make your way to and from the Zodiac while on shore. If you’re looking for a trip that’s going to truly push into regions not seen by the vast majority of the human race then an Antarctic cruise is the way to go. Yes, it does take a little more prep-work than tourist cruises, but it also comes with a much higher level of satisfaction and adventure. Checkout some ideas to get your trip and traveling sponsored. Here’s a pro Northern Lights photography tip. When taking a picture of the lights, it helps to have something relateable in the shot to emphasize just how sweeping the Northern Lights truly are. Line up a mountain, your ship, or one of your friends in the picture. This will give the whole frame a sense of scale. Ittoqqortoormiit, the city found on the east coast of Greenland, is located right next door to the world’s deepest and biggest fjord system, Scoresby Sund. Also, this means you’ll get the added treat of experiencing the planet’s most beautiful landscapes. And if you are in luck, you will be able to capture its whale inhabitants. Whales and the opportunity to zone out on the light show overhead. Hotel Kakslauttanen can be found in Kakslauttanen, Finland and is just 80km from the Russian border. Accommodation options at the hotel include log cabins with their own saunas and snow igloos. Most notable for those chasing the northern lights, however, is the hotel’s glass igloos. These heated glass igloos give guests the opportunity to lie back in their polar sleeping bag and gaze at the northern lights from the comfort of their own bed. A round-trip Arctic cruise sailing expedition from the top of Iceland to the island of Grimsey and back is another chance to meet up with the gentle giants of the deep (especially Minkes, as well as White-beaked Dolphins and Harbour Porpoises) while sailing completely clear of any sort of man-made light pollution. Ready to enjoy the vacation of a lifetime. When planning your trip around seeing the Aurora Borealis, be sure to maximize your vacation by going the right season. If you choose a cruise, this is important as well. Iceland’s Blue Lagoon is the perfect choice for those wishing to warm up their northern lights experience. The lake is a light, opaque blue and its mineral waters provide an idyllic spot from which to lie back and observe the spectacle of the aurora borealis. The Blue Lagoon is not the most common place for the Northern Lights to occur. Those who luck out at the Lagoon can easily take short night-trips to several nearby destinations where the lights are more frequently seen. Many package tours involving northern lights sightings are available and gift experiences are very popular. For those trying to find a gift for someone adventurous who’s into everything from zorbing to ice-skating, giving the gifting of a trip to the northern lights is sure to be a present that won’t disappoint! Built entirely from ice and snow, this frosty marvel is completely deconstructed and reconstructed every year as the seasons change. Located in Jukkasjarvi, visitors from the UK can take a direct flight to nearby Kiruna. The Icehotel is located in the part of Sweden that, during January, has the highest number of clear days, making it well placed for viewing the northern lights. The hotel now offers guided northern lights tours for its guests. Leaving the hotel every night at 11, the guides take guests to the most active spot for the lights on any given evening. Over the centuries, the aurora borealis (or, northern lights) have been interpreted as everything from the ghosts of virgins to walrus spirits to the dancing spirits of the dead. The scientific explanation for the northern lights is somewhat less romantic: the stunning, multi-colored lights are electrically charged particles that have been blown from the sun and get pulled towards the magnetic north pole. Though modern science means the veil of mystery has been lifted, the northern lights still continue to fascinate. The mystery now lies in deciding where they can best be seen. Below is a guide on some of the top spots for gazing. For those coming from Canada or the United States, Fairbanks in Alaska, is a great destination for laying eyes on the northern lights. The advantage of Fairbanks is that once you’ve arrived in the city, you don’t have a long and complicated trek ahead of you to find a spot where the lights are visible. They can, in fact, be seen from the city, but most choose to take a trip away from the distraction of the city lights. There is a beautiful viewing area in the hills of Fairbanks just 32 km away from the city. One of the reasons Fairbanks is so popular is because of its proximity to the highly active area over the Arctic. The aurora borealis is often brightest and most frequent at Fairbanks and the long nights there mean there’s plenty of time to take in the show.